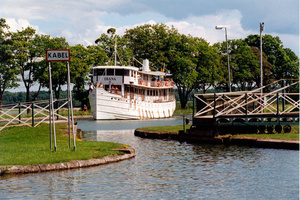 The Mini Canal Cruise is the perfect choice for anyone wishing to try a shorter canal cruise. Despite spending only one night on the ship we promise you many great experiences and memories. 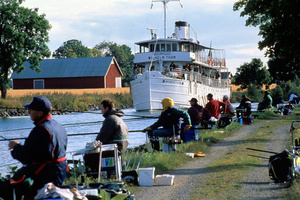 This cruise takes you through the picturesque Östgöta section of the Göta Canal, journeying from Motala on the shore of Lake Vänern to the idyllic town of Söderköping or back. You will enjoy the beautiful eastern section of the canal from the deck of M/S Wilhelm Tham, as well as lovely food and great company. On the way, we pass Borensberg with its well known Göta Canal hotel, two aqueducts, Lake Roxen and Lake Asplången as well as Berg with an impressive flight of 11 locks. The M/S Wilhelm Tham was built at the Motala shipyard and was launched in 1912. There are 25 cabins on three decks providing space for around 50 passengers. The dining room and lounge are found on the shelter deck and the bridge deck offers a covered aft deck with a perfect view. 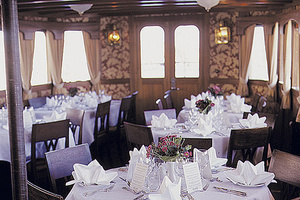 The dining room on the Wilhelm Tham was extended in 2001. The cabins, dining room and lounge were renovated in 2003-2004. Much has been done to preserve the right atmosphere on board, with furnishings that match the period spirit. 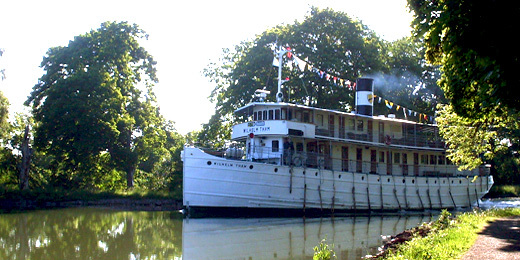 The M/S Wilhelm Tham was listed in 2004 by the National Maritime Museums, considering her historically important. We are naturally quite proud of this distinction as it proves our efforts to preserve the ship have succeeded. 11.00 Dep. Motala - it was Baltzar von Platen who drew up the plans for Motala, and today it is called "the Capital of the Göta Canal". In 1822 an engineering works, Motala Werkstad, was established here to serve the canal, and is today considered to be the cradle of Swedish industry. Here you also find the head office of the Gota Canal Company, as well as a number of museums, including the well-known Motor Museum. We pass Baltzar von Platen's grave along the canal. 12.15-13.00 Borenshult - lock staircase of five locks where you might hear the nightingale sing. 13.00-14.00 Lake Boren -73 metres above sea level. 14.00-14.15 Borensberg - Borensberg has one of the canal's hand-operated locks, after which we see the well-known Göta Hotel from 1908. Just past the hotel there is a small gazebo leaning out over a sharp bend in the canal, known as "the Helmsman's Horror". This gazebo featured on a stamp in 2003. 14.15-17.30 Långkanalen - we travel 20 kms without passing any locks through the astonishing Östgöta scenery. We pass two aqueducts, eight bridges, Ljung castle and Brunneby manor. 14.35 Kungs Norrby, aqueduct - two more recent aqueducts have been built to carry the canal, this one at Kungs Norrby was built in 1993 as part of the national route 36. 17.15 Ljungsbro, aqueduct - we pass the second aqueduct on our journey. This one was built in 1970 over the new road into the community. 17.30 Berg (Heda/Brunnby) - we start our descent down 40 metres in the lock system of Berg (15 locks) towards Lake Roxen. Here you can stretch your legs between the locks, or walk along the canal to Vreta Convent ruins and church.The convent of Vreta dates from about 1100 and was the first nunnery in Sweden. Its importance was later superseded by the convent founded by Saint Bridget (St. Birgitta) at Vadstena. The old convent church at Vreta is one of Sweden’s most interesting, offering many medieval treasures. Today, it serves as a parish church and is therefore not always open to visitors. 18.20-18.55 Berg (Oscar) - After the road bridge in Berg we arrive at the four locks of Berg and Oscar. We dock for the night in the harbour basin between the locks of Oscar and Carl-Johan. 19.00 Arr. Berg (the basin) - the evening offers the possibility to take a walk along the canal, or to go for an evening swim in Lake Roxen below the Carl-Johan lock staircase. 06.40 Dep. Berg (the basin) - we leave the harbour basin and continue our journey. 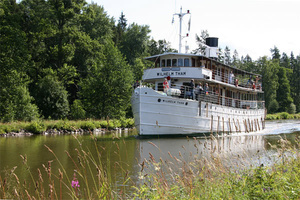 Take the opportunity to go for a morning swim in Lake Roxen or walk along the canal while the ship goes down the locks. 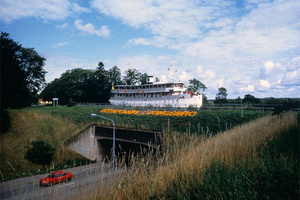 06.40-07.40 Berg (Carl-Johan) - the Carl-Johan lock staircase is the longest in the canal with seven connected locks. 07.40-09.10 Lake Roxen - 33 metres above sea level. 09.10-10.40 Runstorp - Runstorp is a manor house dating from Sweden’s period of greatness. The owners Louise and Eddie Uggla take us on a tour of their house with its Gustavian drawing room and interesting library, all while relating anecdotes from its history. Runstorp is not open to the public, which makes this an exclusive visit. 10.55-11.05 Norsholm lock - here the canal crosses the main railway line between Stockholm and Malmö. 12.30-13.00 Lake Asplången - 27 metres above sea level. 14.15-15.30 Carlsborg–Mariehov–Duvkullen - There are eight locks in the short distance of around two kilometres. Take the opportunity to stretch your legs between the locks. 16.00 Arr. Söderköping - Our cruise ends in the idyllic town Söderköping, which was founded in the early 1200s and was very important during the Hanseatic period. The town also has a long and very interesting history as a spa. Don’t forget to try the famous ice cream! Subject to changes. Note! All times stated are approximate. There are three cabin classes, one on each of the ship's decks - the bridge, shelter and main decks. Most of the cosy, small cabins are fitted with bunk beds and a washbasin. There are shared WCs and showers on each deck. Meals are enjoyed in the mahogany and brass decorated dining room. The salon is a place for socialising, conversing or reading one of the books in our small ship's library. It is possible to book a return trip by bus to the starting point.